Winter Garage Sale. We all know that garage sale is one of the best ways to organize our stuff and all objects. That are not needed at the moment. That way we offer those objects to people that really need them. And after the realization of the trade, we get some money to buy something that we really need. While our home or garage is free from everything that is useless. This process could be especially practical in time when the seasons are changing. For example, after the end of the winter, when the spring starts. We know which were those objects that we didn’t need during the winter and that is the perfect period for getting rid of them. Teresa and her son Ray have decided to organize a winter garage sale. During the winter they have noticed that they have a lot of winter equipment and objects that are really good preserved. So they believe that they will get a good price for them. The mother and the son are in the yard, preparing the garage sale and since they have a lot of objects; it would be nice if someone could help them organize the things better. Let’s work together and try to make everything perfect. Good organization means better opportunity for sale because the clients will have a better overview of everything and choose what they really need. 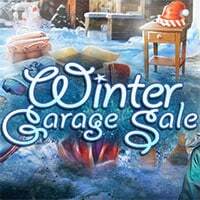 Enjoy and have fun in playing Winter Garage Sale Game.